In the realm of fantasy fiction, they call it “world-building”: the appeal of an entirely distinct universe, perhaps based on some future of our own world, perhaps set somewhere and somewhen else entirely. And it has become the defining go-to approach for contemporary feature animation, as filmmakers look for blank canvas on which to begin their creations. What are things like, they invite us to wonder, within the world of living toys, or sentient cars, or fairytale characters or monsters? The heart goes into the characters, but the details are etched into the unique environment in which they’re immersed. That’s what everyone has been expecting from Wreck-It Ralph ever since the concept and the first trailers leaked out into our world; this would be a journey into the behind-the-screens lives of videogame characters, who interact with one another and move between their respective game worlds when the arcade shuts down for the night. There, it seemed, was the great opportunity for Wreck-It Ralph, in the collision between 8-bit sensibility and the intense, photorealistic next-generation graphics that replaced it. Director Rich Moore — a veteran of The Simpsons and Futurama — brings that sort of modern rapid-fire referencing to the places where the videogame characters congregate, notably Ralph’s “Bad-Anon” support group for digital heavies and the surge protector “central station” where familiar faces like Sonic the Hedgehog and Qbert make cameos. There are also great moments both in the existential confusion among the Fix-It Felix residents when Ralph’s absence leaves nothing in need of fixing, and Ralph’s terror when he finds himself battling monstrous alien insects alongside the soldiers’ hard-core commander (Jane Lynch). 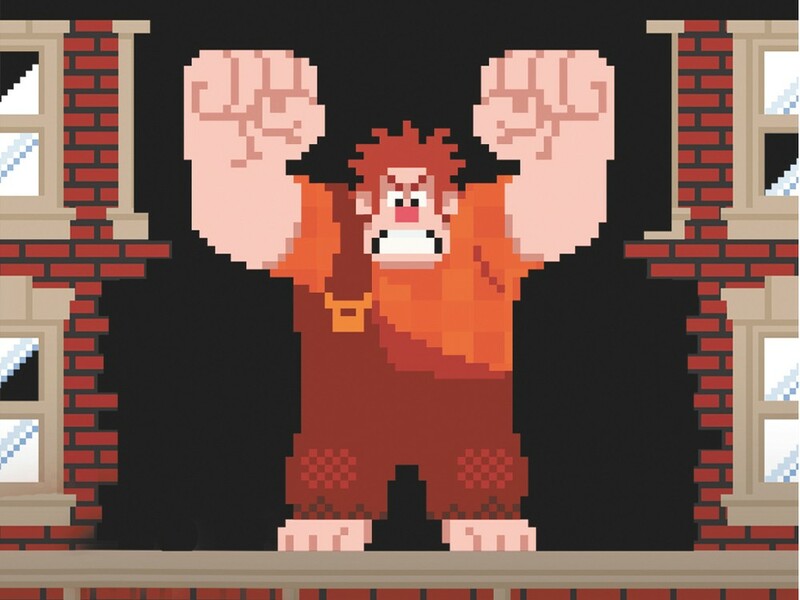 Here, Wreck-It Ralph finds its most effective potential hook. As punchy as the punchlines are, they pull the focus in the wrong direction. Like Ralph himself, we’re stuck in the wrong world. The shame of it is that there’s plenty of imagination on display in Wreck-It Ralph, in deft visual touches like the jittery linear movements of the citizens from Ralph’s world. But that imagination doesn’t extend to finding a genuinely creative way to exploit the idea of consciousness inside a videogame, or with finding potent story elements in places where the rules and limitations are programmed. It’s too easy for Ralph to go wherever he needs to go, which leaves Wreck-It Ralph as a world built without one of the things that most clearly defines a world: identifiable borders. Sat., April 20, 5:15 & 8 p.m. and Sun., April 21, 4:15 & 7 p.m.